Colourful Trips is eco-accredited by the NSW National Parks & Wildlife Service which allows us to take you into the wilderness. Combine this with a visit to an award winning wildlife park with koalas and kangaroos plus lunch and you have a memorable day out with wonderful photos. Get close and personal with some unique Australian animals and birds at one of Australia’s best wildlife parks. You can take a selfie with a koala, feed a kangaroo, laugh with a kookaburra, see a wombat, a Tasmanian Devil and a 4 metre crocodile! 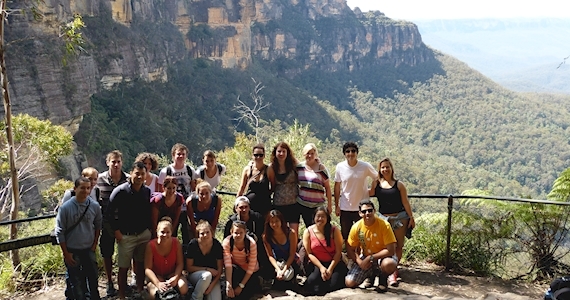 Our eco accredited guide will take you on an amazing bushwalk through the National Park. Learn about the native flora and fauna, look for Lyre Birds, see awesome views and take great photos from stunning lookouts. Lunch After a big bushwalk we have a simple, relaxing lunch. If it’s wet or cold, not to worry, we have Plan B to keep you warm and dry! NOTE: Please bring your own water bottle to help keep our planet green and free of empty plastic bottles.